Yogurt is beneficial in preventing premature aging, reducing discoloration, healing sunburn, reducing skin pores, stimulating hair growth, fighting acne, and yet moisturizing the skin. As it is prepared from milk (obtained by fermenting milk), it contains protein, vitamin B2, vitamin B5, vitamin B12, calcium, potassium, phosphorus, zinc, magnesium, selenium, etc. When including yogurt in your homemade beauty recipes, make sure you use plain, organic, unflavored yogurt without any artificial additives. Simply massaging your skin with this yogurt packed with live active cultures, and then washing it off after 10 minutes can help rejuvenate dull skin. If you have normal to oily skin, use non-fat yogurt. • To cure acne and acne scars, apply a tablespoon of yogurt (preferably Greek yogurt) mixed with a quarter teaspoon of lemon or orange juice. Rinse it off with lukewarm water after 10-15 minutes. • Mix two tablespoons of grated carrot in two tablespoons of yogurt and apply this mixture on your face and neck for 15 minutes to get soft and smooth skin. • Prepare a moisturizing face mask by mashing half an avocado and adding one to two tablespoons of yogurt and three tablespoons of organic honey in it. Leave this mask on your face and neck for about 20 minutes. • Mix some rice flour in yogurt to form a paste and use it as a scrub to exfoliate your skin and remove blackheads. • Exfoliate sensitive skin by gently rubbing on your skin a combination of one cup each of Greek yogurt and oatmeal. You may also add honey in it. This recipe can be used to lighten blemishes and age spots. • Another remedy to reduce age spots involves applying a blend of a quarter cup of yogurt, half a cup of rose water, one cup of water, and a teaspoon of boric acid powder. Here’s a video showing how to make yogurt face and hair masks. • When dealing with sunburn, combine half a cup of Greek yogurt, a cup of chamomile tea and a few drops of grape seed oil. Apply the resultant recipe on your face and neck. When it dries, apply another layer without washing the previous one. So, reapply for about three to five times and then rinse it off. • Prepare a creamy homemade hair-care recipe by blending a cup of yogurt along with three tablespoons of extra-virgin olive oil and an egg yolk to make your hair soft and shiny. To enhance its deep conditioning properties, you may add avocado pulp, too. Leave this mixture on your hair for half an hour and then rinse it off. • Blend a quarter cup each of yogurt, mayonnaise, and an egg white. Moisten your hair slightly and apply this home treatment to hydrate dry, frizzy hair. • Another easy way to use yogurt on your hair is to apply a mixture of yogurt and banana for about an hour. Make this smooth, creamy paste by blending both the ingredients in a blender or food processor. 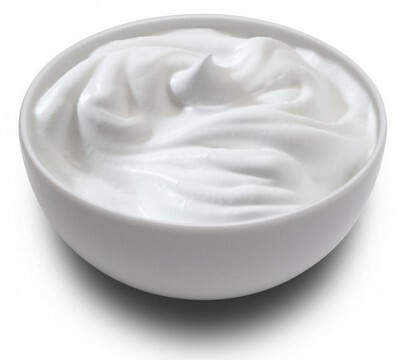 As yogurt is rich in protein, it can help repair damaged hair. Besides, you can include yogurt in your diet to get beautiful skin and hair. Plus, regular intake of yogurt is likely to have a good impact on your overall health as it promotes digestion, builds lactose tolerance, and improves the bioavailability of other nutrients. In addition, it strengthens the bones, cures yeast infections, boosts immunity, reduces blood cholesterol, encourages weight loss, and reduces the risk of high blood pressure.